If you have no backups at all, you probably already realize your data is at risk. Any number of random things—a theft, a hurricane, or a hacker with too much time on his hands—could wipe out everything on your Mac. But you may be reluctant to start backing up because it seems like a big, scary, and possibly expensive undertaking. If that describes your situation, read on for tips on setting up easy, inexpensive backups in as little as 10 minutes. This isn’t a comprehensive strategy by any means (for that, see for my article “Bullet-proof backups”), but it’s a good starting point for anyone seeking a quick fix. Let’s start with your day-to-day files. For file backups, I’m a huge fan of online backup services. My favorite is CrashPlan ( ), but among the other excellent options are Backblaze and Dolly Drive ( ). These services are fairly inexpensive and easy to set up; and if you choose one of them, you can skip the remainder of this section. But if you want the simplest, fastest, cheapest option, let me suggest a different type of product: Dropbox ( ). Dropbox isn’t intended to serve as a full-featured backup service. It’s designed to automatically sync anything you put in a single designated folder (the eponymous Dropbox) to the cloud, and from there, to your other Mac, PC, and iOS devices. In doing so, however, it retains older versions of your files—and even files you’ve deleted from your Mac (with some limitations)—so if you later discover that you need to restore last week’s version of your dissertation or a graphic that you accidentally erased, you can do it easily. Sign up for a free account and download the software at Dropbox.com. Install the software on your Mac. Drag the files and folders that you want to back up into your Dropbox folder. The Dropbox icon sits unobtrusively in your menu bar, but if you click it, you can see details about your recent file-syncing activity. Dropbox accounts are completely free for up to 2GB of data, so start by dragging your most important, and most frequently used files to your Dropbox. If you outgrow the 2GB limit, you can add space for free by doing things like recommending the service to a friend or following Dropbox on Twitter. Or you can pay for more storage, starting at $10 per month for 100GB. Dropbox even offers group plans for businesses. That’s it. The files upload (and continue syncing) in the background as you use your Mac, and you don’t have to change anything about your workflow except the folder where you look for some of your files. You can freely open, save, and otherwise modify anything in your Dropbox, because as far as your Mac is concerned, it’s just another folder. And once your files are synced to Dropbox, you can access them using nearly any device that can connect to the Internet—all you need is the Dropbox software or a Web browser. I recommend Dropbox because it's worked amazingly well for me during the several years I’ve used it. But you can choose from a great many other services with comparable features, including Google Drive, Microsoft SkyDrive ( ), SpiderOak ( ), SugarSync ( ), Wuala, to name but a few. Dropbox and similar cloud-syncing folders are not a good place to put iPhoto or iTunes libraries, because the libraries are likely to be quite large and may not operate correctly when synced between Macs. However, you can achieve a partial online backup of your most recent photos from iPhoto or Aperture by using iCloud’s Photo Stream feature (which you can enable in the iCloud pane of System Preferences); and if you subscribe to Apple’s $25-per-year iTunes Match service, you’ll get what amounts to online backup of your music (as long as your library of songs not purchased from the iTunes Store doesn’t exceed 25,000). Dropbox and similar services are great for stand-alone files, but for personal data such as email, contacts, and calendars you're better off with a service that keeps a master copy of your data in the cloud and syncs that copy to your Mac and iOS devices. 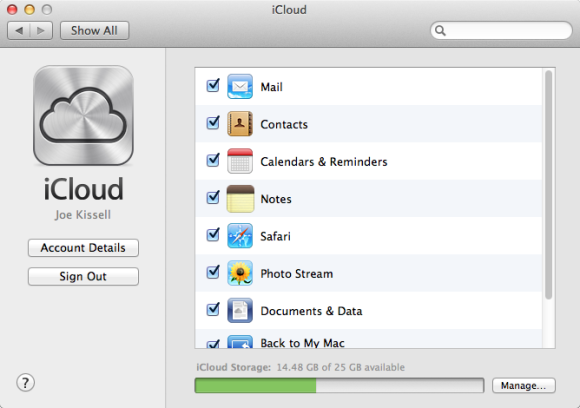 If you still store contacts and calendars locally and rely on POP for email, consider moving your data to the cloud. It’s much easier than it sounds! 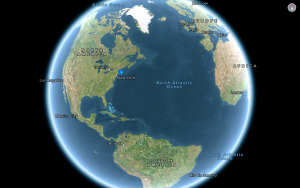 For email, any IMAP server will do the trick, including iCloud and Gmail. The IMAP server always has a copy of your stored email, so if something happens to your Mac, you can download a fresh copy easily. Although IMAP doesn’t qualify as a true backup, since you can’t recover messages that have been deleted permanently from the server, it’s much better than nothing. If you’re still using POP, read “How to convert a POP email account to IMAP” for guidance on switching to IMAP. When you set up iCloud, make sure that you've selected (at least) 'Contacts' and 'Calendars & Reminders', to sync them with the cloud. For contacts and calendars, using iCloud or Google (both free) to store your calendars or contacts is safer than keeping them only on your Mac. Although the exact steps involved vary from service to service, iCloud makes the process especially easy—when you initially activate an iCloud account on your Mac and turn on contact and calendar syncing, the service automatically converts all of your local contacts and calendars into cloud-based calendars. Suppose that you’ve dragged your most important files into Dropbox and that you've turned on iCloud syncing for your contacts and calendars—all in 9 minutes, 30 seconds. A great way to spend the last 30 seconds of your allotted 10 minutes is to find (or buy) a blank external hard drive and hook it up to your Mac via USB, FireWire, or Thunderbolt. Plug a new external hard drive into your Mac and you should see a dialog box like this. Click Use As Backup Disk to use the disk with Time Machine. A dialog box will pop up on your screen asking you if you want to use the drive for Time Machine, the backup software built into OS X. Click Use As Backup Disk. That single click tells Time Machine to start backing up your entire disk to the external drive once an hour, and you don’t have to lift a finger to keep those backups going. Yes, I've stretched my promise of simplicity. Buying an external hard drive requires you to spend both time and money, and you need to make sure that the drive is both large enough and formatted correctly. (For more information, see "How to format a hard drive.") But in principle, you can set up a complete, ongoing local backup of your disk in as little as one click. If you don’t have a broadband Internet connection that makes cloud-based backups feasible, Time Machine is the best option for painless backups.